Frontispiece “Poems on Various Subjects,” London, 1773 (Public Domain). An inch or so of melting snow covered the trail around the George Washington Carver National Monument. The trees and the eaves of the Carver House stood dripping. I soaked up the silence. As a boy, I shared young Carver's fascination with nature. He was my hero. And that day, that landscape, made him real, which made me realize how much more I had to understand. “That's a lot of books,” the ranger said as she rang them up. There were four or five. And “Poems of Phillis Wheatley: A Native African and a Slave” was on top of the stack. Margaretta Matilda Odell's memoir of Phillis Wheatley begins with these words—harrowing for their politeness. It brings to mind Paul Giamatti's portrayal of slave trader Theophilus Freeman in the 2013 movie “12 Years a Slave,” brutal and mundane. When the Wheatleys realized her aptitude, they taught Phillis to read and write English and then Latin. They sheltered her from the harshest realities of slavery and from the poverty suffered by free blacks, but she remained a slave. Suspended between worlds, or as June Jordan writes, made "this valuable/this hated thing," Phillis Wheatley found her voice. Her Christian faith provided not mere spirituality or gratitude but a critique of the institution by which she came to America and to her faith itself. Her 1770 elegy “On the Death of the Rev. Mr. George Whitfield” earned her wider recognition, and when appeals to publish her work failed in America, she eventually secured the help of Selina Hastings, Countess of Huntingdon, to whom her first volume of poetry, "Poems on Various Subjects," was dedicated. “Thoughts on the Works of Providence” was one in that collection. To guide my soul, and favour my intent. Triumphant o’er the winds, and surging tides. What Pow’r, what Wisdom, and what Goodness shine? And yet creating glory unador’d! Abhorring life! how hate its length’ned chain! From air adust what num’rous ills would rise? Ascending dost adorn the heav’nly plain! His Wisdom rules them, and his Pow’r defends. And never, never raise the filial pray’r? All lovely copies of the Maker’s plan. That call’d creation from eternal night. And now through all his works diffus’d abroad. Where Fancy’s queen in giddy triumph reigns. The lab’ring passions struggle for a vent. And gives improv’d thine active pow’rs again? And with its murmurs load the whisp’ring gale? And is not man immortaliz’d by me? Thus Love pronounc’d, and Reason thus reply’d. She clasp’d the blooming goddess in her arms. This second selection, "Niobe in Distress for her Children slain by Apollo: from Ovid’s Metamorphoses, Book VI. and from a view of the Painting of Mr. Richard Wilson" demonstrates Phillis Wheatley's conversance with Latin. 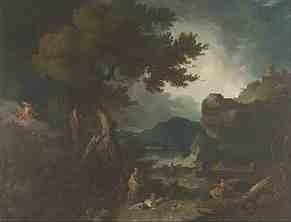 by Richard Wilson, 1760 (Public Domain). Tho’ last and meanest of the rhyming train! Rolls the loud-pealing thunder thro’ the sky. To give their incense to surrounding air? Say why this new sprung deity preferr’d? Why vainly fancy your petitions heard? While to my goddesship no tribute’s paid? And Phrygian nations all revere my name. Where’er I turn my eyes vast wealth I find. Lo! here an empress with a goddess join’d. To whom the spacious earth a couch deny’d? ’Till pitying Delos took the wand’rer in. Round me what a large progeny is spread! No frowns of fortune has my soul to dread. More than Latona’s number will remain? Nor longer off’rings to Latona pay? The spouse and sister of the thund’ring Jove. The God, whose glory decks th’ expanded skies. Thebes trembled as th’ immortal pow’rs alight. The feather’d vengeance quiv’ring in his hands. And rul’d the fury of his flying steed. Smites through thy neck, and sinks thee on the sand. Beat his torn breast, that chang’d its snowy hue. His issuing entrails smoak’d upon the ground. “Why is such privilege to them allow’d? Why thus insulted by the Delian god? Dwells there such mischief in the pow’rs above? Had plung’d the deadly dagger in his breast. She weeps, nor weeps unpity’d by the foe. With them I too am carried to the grave. But show the cause from whence your triumphs flow? Struck dumb——indignant seeks the shades below. After the death of Mrs. Wheatley, Phillis Wheatley married John Peters, a free black man, and they suffered in the harsh economic conditions during and after the Revolutionary War. A second volume of poetry was lost when once again no American publishers took it up. And Phillis Wheatley died December 1784. 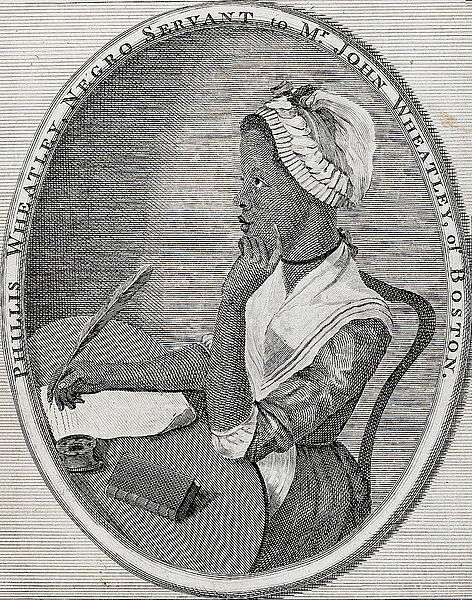 Abolitionists used Phillis Wheatley's work to argue for the humanness and capability of her people. But in the political defense of what should be self-evident sometimes we risk not getting the whole story. The challenge of her work to me is the realization that I have not really loved my neighbor until I see her—not merely as confessor of a common faith but as fellow confessor, not merely as an individual but as someone her own, not as an example to be cited or someone to be reached but as someone to be heard.